During a sudden downpour in Seoul on Monday evening, Euljiro turned into a ghost town surrounded by a modern megapolis. Located south of the Cheonggyecheon in central Seoul, most of the shops and restaurants in Euljiro closed their business after a busy day dealing with customers visiting electric shops and publishing companies. But at the end of the dark alley, a light still glimmered. Under the roofs decorated with small flags of different nations, crowds of people sat in bright red plastic chairs drinking cold beer in the humid summer night. Kim was not the only regular visitors to the back alley beer festival. The 500-meter long stretch of streets was filled with office workers dressed in suits, young couples on a date night and senior citizens reminiscing about the good old days. 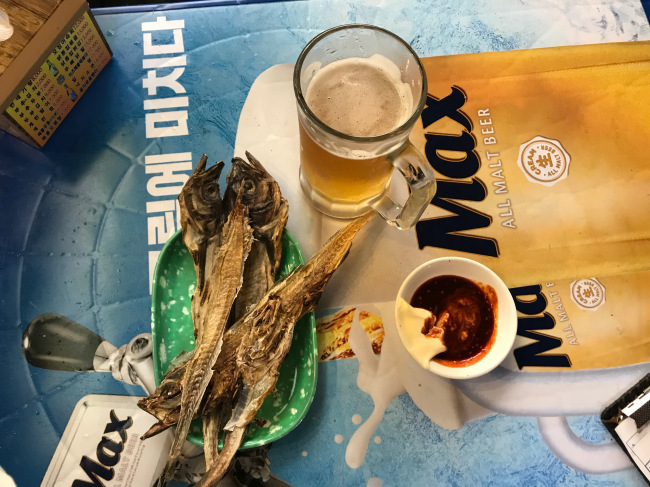 Whatever their reasons for coming to the outdoor pubs lining Euljiro, they appeared to enjoy the same thing -- a pint of cold beer with nogari, dried young pollock fillets grilled over charcoals. In fact, the neighborhood is known as Nogari Alley. While the visitors said there was nothing special about the taste of the beer or the fish, what set them apart from those sold at other pubs is the cheap price. A nogari fillet was sold for 1,000 won ($0.90), and beers went for 3,500 a glass. Another attraction was an exotic spicy sauce served along with the nogari. While the detailed recipe for the sauce is “top secret,” the mixture of mayonnaise and red chili is the best fit for crisp nogari with a cold beer, Chung said. Chung’s store is one of the older pubs that filled the streets in the early 1980s. The oldest pub here is Ulchi OB Bear opened in November 1980. Currently, a total of 17 pubs run their business at Euljro Nogari Alley. Even though the first few pubs opened for business when South Korea was going through an economic boom in the 1980s, most started thriving during the financial crisis in 1997 by providing office workers with cheap but hearty food. The big challenge came around during the 2008 economic shock. When business shrank, disputes increased between pub owners. Some of them had territorial disputes over the narrow two-lane road running through the street. “There had been clashes between residents and pub owners. 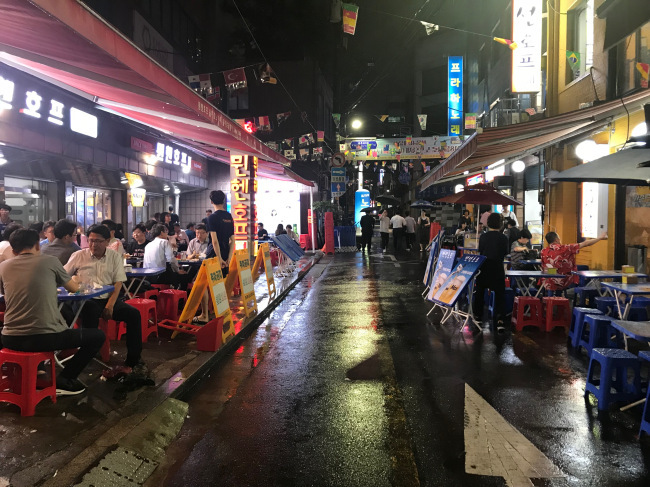 ... We don’t want to see drunken strangers yelling at each other in the middle of the night,” said 52-year-old Kang Yoon-seong, who has resided in Euljiro for 21 years. Since then, the pub owners have organized themselves by setting up their own regulatory committee. At the same time, they have demanded permission to operate from local authorities, as the sale of food outside of restaurants is prohibited under Korean law. Jung-gu district office eventually accepted their request last year. They revised an ordinance to allow local pubs to seat customers on the street with a payment for using the two-lane road. The city has also taken a series of measures to make Nogari Alley a must-see tourist attraction for those vising Seoul. The street was designated a “future cultural heritage” by Seoul Metropolitan Government in 2015.